Somewhere in a windowless, cinder block room in the basement of an institutional building in Olympia, Washington police officers are passing on secrets. Meanwhile the folks on the 2nd floor might look at introducing strict anti-biker legislation which would allow organizations to be banned and people prevented from associating. And in the Capital parking lot the WSP decides this is the “right time” to send a message to motorcyclist and started photographing everyone who arrived including clubs, motorcycles and license plates. In my youth I would have been overly alarmed, but there is more to aging than just gray hair. Wistful yearning for something past or nostalgia as it is known, is also part of the aging process. I should have been a cowboy. At least they have remained true to their lifestyle. Cowboys are still respected and no attempt has been made to take their freedoms away. They can wear a cowboy hat, a bandanna or whatever they choose and have never been made part of gang legislation. Their ride, the horse, has not suffered the embarrassment of their counterpart, the motorcycle. It still has four legs and the mechanisms for riding has remained the same for a lot of years. No attempt has been made to legislate an air bag, legislate noise, legislate riding attire or have it talk to you! A cowboy has not been banned from a bar because boots and a PBR buckle were deemed clothing symbols representing a banned “group.” Cowboys have no profiling concerns, no harassment or false pre-text stops like many motorcycle enthusiasts. You see we’re slowly allowing the government and law enforcement agencies to take away our rights and dictate to all motorcycle enthusiasts what we can and can’t wear and who we can associate with. Today it’s biker clubs then tomorrow they will target the Lions Club or whoever else they “feel” like making out to be a bad organization. Do you think I’m off base or headed in the wrong direction? Then consider this. People make decisions that carry extremely different levels of healthcare risk. For example, fatalities on motorcycles are far more likely than in cars (35 deaths/million miles vs. 1.7 deaths/million miles) (1). Motorcyclists are also four times as likely to be seriously injured (2). Many legislators don’t thing car drivers should subsidize the costs for the increased risks taken by motorcyclists. But when you really look at this situation it’s employers who purchase health insurance so they can decide what to cover. And guess what? Companies have exclusions for items that the executives considered unwise: no coverage for treatments resulting from motorcycle accidents, sky-diving etc., (3). In short, “Black Thursday” was represented by over 100 riders with the same goal. There were independent motorcycle enthusiasts, Veteran clubs as well as 1%ers all focused on exercising their constitutional rights as citizens to actively lobby representatives who control the destiny of Washington state motorcycle riders. Congrats to WAC.o.C. and ABATE on a professional and well attended day in the democratic process. Photo courtesy American Cowboy Coffee. 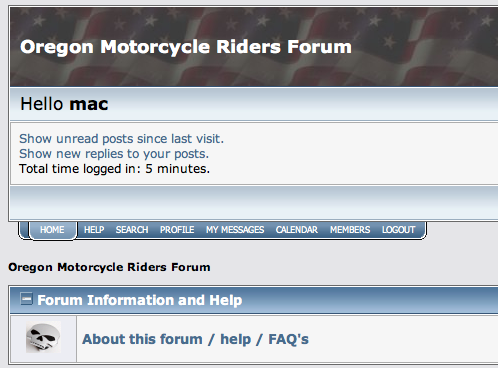 Calling all motorcycle riders to the Oregon Riders internet forum. If you’re unfamiliar with an internet forum, or message board – its a bulletin board system in the form of a discussion site. From a technology viewpoint, forums or “boards” are web applications managing user-generated content. They allow anonymous visitors to view the contents, but registering (an easy less than 5-minute process) allows users to submit topics for discussion (known as threads) and communicate with each other using publicly visible messages (referred to as posts) or private messaging. In an effort to reach out to a broader set of riders across the state, Don Mason (Coordinator, Hub City ABATE Chapter) has created a new concept called the Oregon Riders forum. He’s running this site simply for his interests in motorcycling and it’s separate from ABATE. Thanks Don for your support and a quick shout-out to “Windy Joe” for illuminating the site. To give riders in Oregon a single place to get information and share their love of riding and the bike lifestyle. To provide a place for real-time discussion and collaboration for MRO’s and other groups throughout the state. To provide a place for MRO’s and other riding groups to announce and find what is going on for riders in the Northwest. This forum is for ALL riders and is not affiliated with, influenced by, or run by, any specific organization. The intent is to build and hopefully have a thriving forum… a “hangout” if you will for Oregon riders who are involved, talking to each other, and getting together for rides, events and legislative issues. There are a lot of riders in Oregon and it would be cool to see large numbers of people “virtually” gathering. Photo courtesy Oregon Riders web site. 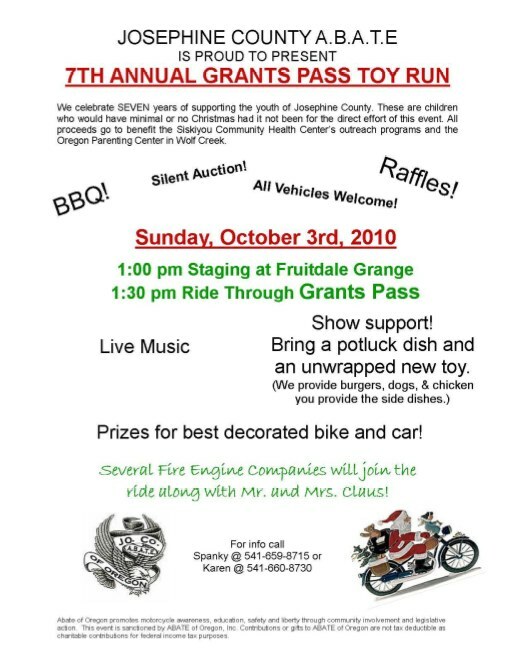 KOBI News is reporting that the “GREEN NATION”, aka the Vagos Motorcycle Club is holding a west coast “meeting” in Grants Pass this weekend (August 9-10). Their signature “colors” – shades of green and a red demon caricature of Loki, the Norse god of mischief will be “flying” in southern Oregon. Should we care? I’m not so sure, but given all the historical issues (dating back to 1999 and mostly bad) and the hefty fines, I find it curious the Vagos decided to hold a meeting in Josephine county again. Sure, it’s a free country…at least the last time I checked the First Amendment was alive and well, but the bad blood and community fears of violence will surely loom over the event and may cause an overreaction from Sheriff Gil Gilbertson…similar to Sheriff Dave Daniels days. Why risk police stops for “DWV” – driving while Vagos? The group plans to meet at Schroeder Park, just outside of Grants Pass. Vagos MC member, Harry Hart (a Dentist in CA.) claims they are a “motorcycle family who come together and associate with one another and the police have it all wrong”…”it’s blown all out of proportion”. 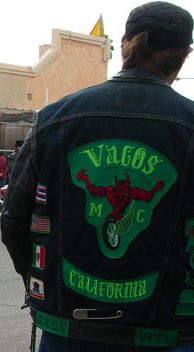 The Vagos Motorcycle Club (Vagos) has hundreds of members in the U.S. and Mexico and poses a serious criminal threat to those areas in which its chapters are located. 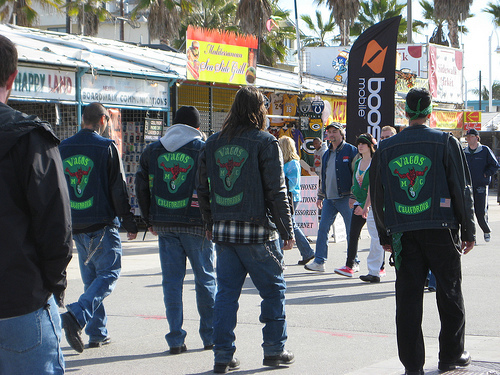 U.S. law enforcement authorities report that the Vagos have approximately 300 members among 24 chapters located in the states of California, Hawaii, Nevada, Oregon and three chapters located in Mexico. The Vagos produce, transport and distribute methamphetamine and are also involved in the distribution of marijuana. The Vagos have also been implicated in other criminal activities including assault, extortion, insurance fraud, money laundering, murder, vehicle theft, witness intimidation and weapons violations. In the U.S., the Vagos are mainly active in the Southwest and Pacific regions. Before I get a bunch of comments about taking too many falls without a helmet, let me just say I know one member breaking the law is one thing and to paint an entire club or over-generalize is quite another. But I also know that OMG want to give the impression they are a just a harmless riding club. Maybe its because so many states are doing what California is, once linked to a gang, the penalty for a crime is much more severe. Here’s my point. I’m not passing judgement, but hope the Vagos MC members avoid big trouble in a small town so the state can avoid an enormous waste of taxpayer dollars and focus on higher profile criminally active street gangs. Photo courtesy of Venice Beach org.